The Journal of Prolotherapy team of Ross Hauser, MD, Nicole Baird, and Doug Skinkis, met with Jeri Coffey, DDS in her office in Riverside, Illinois. Dr. Coffey is often referred patients whose headache and neck pain may be due, in part, to dental occlusion problems. She is trained in the Dawson Technique of dentistry, which stresses the importance of functional occlusion. In this interview, Dr. Coffey discusses how headaches, migraines, and neck pain are often related to a bite problem, and how correcting this can result in lessened intensity and frequency of headaches. She explains the specific questions she asks patients to determine if there is the likelihood of malocclusion being one cause of their headaches. In addition, she explains the key differences in how a patient without headaches will generally present compared to a patient with chronic headache and neck pain complaints. The Journal of Prolotherapy team of Ross Hauser, MD, Nicole Baird, and Doug Skinkis, met with Jeri Coffey, DDS in her office in Riverside, Illinois. Dr. Coffey is often referred patients whose headache and neck pain may be due, in part, to dental occlusion problems. She is trained in the Dawson Technique of dentistry, which stresses the importance of functional occlusion. As Dr. Coffey demonstrated during our interview, headache, neck pain, and migraine patients have key differences in their bite that are indicative of a dental component to their condition. JOP: When do you believe a migraine is related to a person’s bite? Dr. Coffey: I think most migraines have some element of a bite issue. If you have headache patients that you have ruled out organic causes for, and your only effective treatment is pain medication, you need to consider a dental bite problem as a possible cause. When I see patients, the first thing I ask them is where exactly do they feel the migraine. If the patient has a one-sided headache/migraine, I feel there is a high probability their bite is involved. Or if someone has one-sided neck pain or shoulder pain, I’ll check their bite. The typical bite-related headaches are felt in the suboccipitals, temporalis, and/or migraine. Figure 1. In headache patients, very often the condyle is never fully seated which, in turn, never allows the surrounding musculature to relax. JOP: How do you explain the ligament and other structural involvement to a patient? Dr. Coffey: In dentistry we used to just put the blue paper in a patient’s mouth and have them close it. Well, that proves that the teeth come together, but how does that relate to the joint? We want the teeth and the joint to be able to close at the same time. Some places we want the teeth to come together and touch, and other places we do not want them to touch. When you look at the teeth and where they are “marking” or touching, we want nothing to touch on an incline because then it moves your jaw. We also want nothing to touch in the back of a tooth, because it will shove your jaw forward or backward. In the perfect bite, every tooth is hitting, at the same time and the same intensity all around the entire mouth. Now, in some bites it is impossible, and you cannot get that 100%, but it’s what you’re shooting for. When I’m talking with a patient and I see there is a spot hitting on an incline, I explain that we need to erase that because the incline is interfering with that joint seating. It’s more important that the joint seat, than the teeth seat. There are ligaments connecting the lower jaw to the back of the skull and those are the ones we don’t want to stretch out. If you dislocate over and over again, you are really going to over stretch the TMJ ligaments. These will totally fatigue and then you do not have a guard from that joint unseating. You also begin wearing down the disc in the condyle. Teeth are designed to take pressure along their axis on a vertical plane. When teeth hit opposing teeth on a diagonal plane, versus vertical, it unseats the TMJ. When teeth are together, there are certain parts of the teeth that should touch, and other parts that absolutely should not touch. Headache patients have a lot of “not touch” areas touching. The dental procedure of equilibration relieves the “not touch” areas. Hence, it redirects the forces into a vertical plane, thereby allowing the joints to fully seat and the musculature to finally relax. JOP: So, to a patient sitting in front of you, what do you ask them during the exam? Dr. Coffey: First thing I ask them to do is “Bite your teeth together a few times fast.” Then I ask this exact question, and the phrasing is important: “Which side hits first: the left, right, or front?” The right answer is nothing should hit first. All the teeth should all hit at the same time. When biting teeth together fast, nothing should touch first. If one or several teeth hit first, this is an immediate sign that there is a bite problem. When you make a patient choose a side (right, left, or front), the right answer is actually “neither, everything hits at the same time.” But I do not ask them “Does anything hit first?” because the answer will be “No.” So phrasing the question the first way makes the patient concentrate on what is really happening when they open and close. For headache patients, I will manually seat their condyle and I will then tap their teeth together a few times fast. I want them to answer the same question to see if they notice a difference when the condyle is properly seated. I’m looking for their point of interference. Headache patients will tend to hit on one side first when I’ve seated the joint versus when they tap their teeth together on their own. Patients may also begin to open up and tell me things that happen when they bite, often confirming the recruitment of additional musculature to eat or when using their jaw. For instance, some people who tell me they hit everywhere at the same time are actually dislocating and recruiting muscle groups in order to do that. It still means the joint is not seated properly and those jaw muscles can never relax. Upon examination, some patients will also present more classic problems that indicate a bite problem. Often this can include a large difference between the upper teeth and lower teeth, which is called an overjet. It can be the presence of tori, which are bony bumps on the roof or floor of the mouth. Or it may be a noticeable abfraction lesion, which is a ditched out area of the tooth, near the gum line, which you can feel with your finger or fingernail. (See Figure 2.) For example, with tori, the patient may be really working like a maniac on their teeth, much more than the average person. So, the body is going to try and build up the area around the teeth to support it. Figure 2. Examples of some additional classic dental problems that indicate a bite problem. Dr. Coffey manually seating a patient’s condyle to see which teeth hit first, compared to when the patient taps their own teeth together. JOP: You also use a questionnaire for your patients to rule out a bite problem. Can we go through that? Figure 3. Patient questionnaire to recognize when headaches and facial pain have a dental cause. Three or more “Yes” answers are indicative of a bite problem. 1. Do you have teeth that are sensitive to cold? 2. Do you have any teeth that have fractured, chipped, or cracked? 3. Do you have any crowns that have fractured, chipped, or cracked? 4. Do any of your teeth show wear? 5. Are any of your teeth shorter than the used to be? 6. Have your gums receded around any teeth? 7. Do you have abfraction lesions? (Ditched out spots near gum? 8. Have you had fillings break? 9. Do you have any loose teeth? 10. Are any of your teeth tender to biting or chewing? 11. Do your jaws get tired of chewing? 12. Do your jaws get sore? 13. Can you chew gum? 14. Do you chew gum for more than an hour per day? 16. Do you get more than two headaches per year? 17. Do you suffer from stiff necks? 18. Do you suffer from sore/tight shoulders? 19. Do you get frequent ear pain? 20. Do you have tinnitus? 21. Do you hear your jaw pop when you open or chew? 23. Do you clench your teeth? 24. Do you grind your teeth? 25. Is your tongue frequently pushed against the roof of your mouth? 26. Do you have jaw joint pain? 27. Are any of the four muscles of chewing tender to touch? JOP: On this questionnaire, one question is if the patient can chew gum? Dr. Coffey: Yes, and not “do you” but “can you.” Generally there are two extremes. The first is the person who cannot chew gum because it almost immediately causes aching and stress in the jaw. The other extreme is the person who chews gum all day long because their jaw is so fatigued that is the only thing that brings some relief in the jaw muscles. Otherwise, they will clench their jaw all day. JOP: Ringing in the ears is an interesting one. Dr. Coffey: Since I began asking that question, I’ve had three people who had complained about tinnitus and it cleared up after we fixed their bite. The thought is if your jaw is unseating, or pounding up and back down, all day long, you can get ringing in your ears. Another one “Do you hear your jaw pop?” sometimes they won’t hear it, but others can. Or you may be able to feel it. If you feel it pop out, there is a 100% chance the patient has a problem with subluxating. But one of the most interesting questions for most people is the location of their tongue through the day. Realize that 95% of the day is considered “at rest” for most people, meaning they are not chewing, speaking, or swallowing. Your teeth should be slightly apart and your tongue should be in the valley of your lower teeth. Again, you should only bring your teeth together when you chew, speak, or swallow. But when your tongue is glued to the roof of your mouth it creates suction. It’s a splinting technique. When people answer “no” to this question about their tongue, but I can tell they have a problem with subluxating, I ask them to check and get back with me. I tell them “For the next two days check in with yourself once per hour.” Ask yourself two questions. First, “Are my teeth slightly apart, or clenched together?” Second question is “Where is my tongue? On the roof of my mouth, or in the valley of my lower teeth?” Most people are surprised to learn that they spend most of the day with their tongue plastered to the roof of their mouth! Creating this suction takes off about 50% of the stress on the muscles. JOP: What are some symptoms a physician can look for? Dr. Coffey: There are some key factors in their medical history that may point to a bite problem. (See Table 1.) The last question of the questionnaire is an easy thing a physician can do. Palpate the mastication, or chewing, muscles to check for tenderness. So, you can palpate the masseter, the temporalis, and the medial and lateral pterygoids, and ask the patient if there is soreness when you press on these areas. (See Figure 4.) This can indicate areas that would need to be addressed due to a bite problem. Also, one of the most obvious physical signs to look and feel for is the patient’s jaw dislocating upon opening their mouth wide. Table 1. Normal patient versus headache patient. Experiences less than two headaches per year. Experiences two or more headaches per year. Extremely infrequently experiences a stiff neck. Frequently experiences a stiff neck. When biting teeth together fast, nothing should touch first. When you make a patient choose a side (right, left, or front), the right answer is actually “Neither, everything hits at the same time.” When biting teeth together fast, one side is hitting first (right, left, or front). At rest (while not chewing, speaking, or swallowing), the teeth should not touch at all. They should only come together to chew, swallow, or speak. Top and bottom teeth are touching all the time, only coming apart when they chew, swallow, or speak. At rest, the tongue should be in the valley of the mouth. The tongue is plastered against the roof of their mouth constantly. This is the body’s effort to create a splint for the musculature through suction. There is not subluxation of the mandible upon opening the mouth wide. This can be felt by placing both hands on cheeks with fingertips right at the ear, upon opening and closing the mouth. 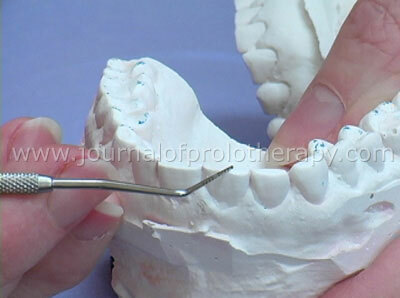 There is a lateral pop out of the heads of the mandibular condyle upon opening the mouth wide. This proves the joints and the teeth do not match, often causing headaches. No cracked or fractured teeth, unless the reason is related to trauma. Multiple cracks or fractures indicate a probable bite discrepancy. No history of cracked, chipped, or fractured crowns. History of cracked, chipped, or fractured crowns is almost 100% due to dental occlusion problems. No tinnitus. Often patients suffering from tinnitus have a bite discrepancy. Figure 4. Palpating the mastication, or chewing, muscles for tenderness may help indicate a bite problem. One last trick is, with a gloved hand, put your finger in their mouth and see where the tongue goes. Most often in cases where people unknowingly keep their tongue suctioned against the roof of their mouth, you will see them move their tongue back as you enter their mouth. If you hold your finger toward the roof of their mouth, and ask them to just leave their tongue in the valley of their lower teeth, see if they are even able to do it or if they are still pressing against your finger. Many people just don’t know how to keep their tongue down, because it is always at the roof of their mouth and that they do not even notice it being there anymore. JOP: Very interesting, you know this is not something that most physicians would be looking for or were trained in. Dr. Coffey: You know, this is relatively new over the last seven to ten years that the way we adjust teeth has changed. We used to seat the jaw by going up and back and adjust the teeth that way, and it was horrible. But the more cadaver research that was done really showed that the mandible seats forward and up. Once we realized that it has a definite stop and it’s reproducible, there is something called an articulator where I can make models and take records on a patient and it is 100% reproducible, provided we go up and forward. So, we used to think the jaw seated back and up, but it’s really forward and up. Pete Dawson, DDS who did a lot of the research on this is considered the father of modern dentistry. 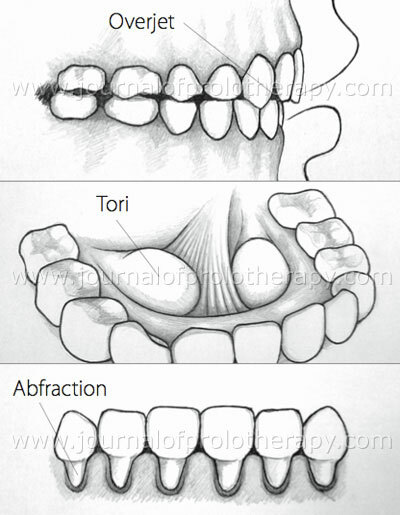 JOP: What is the equilibration procedure like when someone wants to correct their occlusion problem? Dr. Coffey: Equilibration is just a light sanding so teeth can seat evenly. Basically, I will mark their teeth to see what is not lined up correctly and I will “erase” those, which means I very selectively and minimally grind down the areas that should not be touching. Then people will often say “Oh my goodness, you’re grinding my teeth?! ” I explain that actually you are grinding down your own teeth, and you are doing it indiscriminately. So, I’m going to do it less than you are, and then you’re going to be able to stop. So, instead of your teeth becoming flattened because you’re grinding down everything, I’m going to find a tiny little spot and only take off about a tenth of a millimeter. One case I have here is a girl who is 35 years-old. At mid-thirties, the normal length of these front teeth should be 10mm. She has ground hers down to 6.5mm. It’s an excessive amount of wear. So, on the questionnaire, where it says “Do your teeth look shorter?” She would say “yes.” She’s worn away over a third of her natural teeth. For years, I thought she was biting her fingernails or would just assume that she was nervous and grinding her teeth down in the front. But it was actually because she had so many interference issues in the back teeth that it was making her do that. She wasn’t doing it because she was nervous, there were so many things happening in the back teeth that it was driving her jaw forward to give her relief. JOP: What do you tell someone who says that they’ve already had their teeth shaved, or they wear a splint and have had a lot of dental work done already? Dr. Coffey: I tell the patient that you’re obviously still symptomatic even though you’ve worn all these different splints. So, why don’t we do some of these tests and check if this is a possibility for you. I often share my own story with patients. I had a headache every day for 90 days, and I’ve worn every splint known to man. I had a lot of occipital headaches that turned into migraines. I knew it was my bite, I just could not prove it. Because everything we’ve read and studied, and everything that we’re taught in dental school does not go into this. I took the course a couple years ago and I was able to get substantial relief from my headaches. I went from having a headache a minimum of 20 days out of the month to only a couple very minor, manageable headaches a month. So, for me, this was a huge improvement. The splint that I wear now is different than any splint I wore in the past. What we realize now with splinting is we have to cover all of the teeth and keep your back teeth from touching with the splint. It reduces the compressive force and I can generally alleviate a patients symptoms this way. Dr. Coffey demonstrating the cast of a 35 year-old woman whose teeth are over a third shorter than normal, due to abnormal grinding. JOP: Do you find that people still need to wear a splint afterward? Dr. Coffey: About 20% of people, no matter if their equilibration is perfect, still need a splint at night. The majority of people do not. But 20% of people will sleep with a splint at night, but will wear nothing during the day. JOP: What types of results are typical after an equilibration procedure? Dr. Coffey: Most headaches have multiple triggers, and the aspect I am involved in is correcting the bite. When the joint is seated properly and the muscles all start doing the jobs they were intended for, and for the lengths of time they were intended to do them, the headaches lessen considerably. If the bite is one of the primary causes of the headaches, you can expect a minimum of 40% reduction in headache numbers and intensity from this aspect. First I will do a spot adjustment, which acts as a test. When we know the bite is off and the patient has headaches, I will do a spot adjustment to see if the whole procedure is likely to be beneficial. Often patients will have relief right afterward for four to five days. Then after those days, the headache will come back. I tell them this is normal and not to be disappointed. It is only to see if the test works, we then move ahead with the remaining adjustments. I’d say 80% are good after the full procedure, and 20% may need additional work as the musculature relaxes. BJ came to Caring Medical at the age of 38 for care of his temporomandibular joint syndrome. He stated that he had suffered with it for most of his life. Despite going to several dentists, getting his “teeth shaved,” and wearing many different appliances, he continued to suffer facial pain with loss of motion in his jaw. He woke up with facial pain (bilateral, though worse on the right). He received numerous Prolotherapy injections to his TMJ’s, over the course of several years. BJ would get almost complete pain relief with Prolotherapy, but the pain would eventually come back. A referral was made for BJ to see Dr. Coffey. Dr. Coffey’s assessment: This patient presented with nearly flat posterior teeth and completely flat, straight edges to his anterior teeth, demonstrating excessive wear. At first, we made appliances to keep his teeth apart at night and during sports. He also reported TMJ pain that had persisted after other treatment attempts. The appliances had some positive benefits initially. The patient’s upper right first molar became increasingly painful, without an apparent cause. My impression was that it was bite related, but minor adjustments did not bring sustained relief. That tooth eventually abscessed and was treated with root canal therapy. Around that time, I was taking substantial additional training in Occlusion. (How teeth fit together with respect to the TMJ, not independent of it.) I checked to see if his ideal joint closure position matched his actual full tooth closure position. It did not, and was substantially off. I believe the nerve in the tooth died as a result of this discrepancy, because that tooth was a significant offender in the shifting of his mandible. We did an equilibration to get the joints and the teeth in sync, and the patient was delighted to have significant relief (95%) from his TMJ pain. He also attributes it with improvement in his athletic skills, which can be substantiated by a study that was done with Olympic weight lifters. When wearing dental appliances that balanced their TMJ’s, they were able to lift much more weight. Though MV was in her mid 70s, she was extremely active. Her only complaint was terrible neck pain with tension headaches. The headaches were primarily occipital in location. Typically her headaches were associated with neck pain. She was initially treated with Prolotherapy and had about 90% relief of her neck pain and headaches, but the pain returned after a year. While another course of Prolotherapy relieved the majority of her pain, it could not relieve it all. She was referred to Dr. Coffey for a dental assessment. Dr. Coffey’s assessment: This 74 year-old patient presented with a chief complaint of neck pain that woke her from sleep and 15-16 headaches per month. It is rare for a 74 year-old patient to have all of her natural teeth. This patient did. When I positioned her jaw with my hands, and mechanically tapped her teeth with my motion alone, her right side touched first. That almost always indicates a shifting of the mandible during closure, which can cause neck pain and headaches. Because this patient did not live within an easy commute of my office, I chose to try reversible procedures first. I had the patient sleep with an “Aqualizer” appliance (a very soft temporary appliance that keeps the posterior teeth apart). If she had no relief from that, I was reluctant to treat. (This patient lives in another state). The patient phoned in 10 days with all neck pain completely resolved. She returned to have me make permanent splints to sleep with, and is very pleased with the results. Note: When I do an equilibration, I like to have the patient available during the next few days in case we stir up a hornet’s nest. I want to be able to “fine tune” the adjustment in case the patient is bruxing. Because this patient did not live close, had a dentist in her state who would not be able to fit new dental work into her adjusted bite satisfactorily, had worked with her dentition all of her life, and was satisfied with her comfort level, I stopped there. BC is a 40 year-old, long-time Prolotherapy patient. Over the course of several years, BC had been treated for numerous injures to various body areas, each with a very good response to the treatment. In 2005, she developed what was diagnosed as trigeminal neuralgia (primarily on the right side). This caused severe and disabling lanciating pain in her face, mouth, scalp, and chest. She was treated with numerous Prolotherapy and neural therapy treatments to her face, which would temporarily relieve her symptoms. However, the pain would eventually return. In addition, BC suspected a dental cause, and had work by other dentists which included a root canal, followed by the pulling of the root canal, and having a bridge put in. She has also seen a multitude of specialists and clinicians including an ENT doctor and neurologist, because of the incapacitating pain, which was not relieved, even by strong medications, including anticonvulsants and pain relievers. BC was referred to Dr. Coffey for an assessment. Physicians can call 800-952-2178 to reach the Dawson Center, for the name and number of a Dawson-trained dentist, based on the patient’s location. This is a number for medical professionals only. 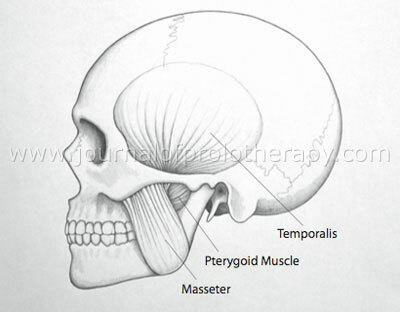 dawson technique, equilibration, functional occlusion, headache, malocclusion, mandibular condyle, migraine, neck pain, temporomandibular joint, TMJ, Doug R. Skinkis, Nicole M. Baird, CHFP, Ross A. Hauser, MD, Volume 2 : Issue 3 : August 2010, Wonder Why?